As a scribe myself, I've always been amused by the fact that journalism (or the most glamorous version of it) seems to be a favorite career for the heroines of chick-lit paperbacks and romantic comedies where somehow advice columnists and how-to girls can afford to live a lifestyle worthy of Harper's Bazaar. 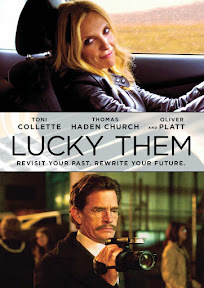 Although not technically a romcom, Lucky Them is that rare film centered around a female journalist that not only manages to get the details of the career right but also nails the indie music scene that fuels the events of — and serves as the backdrop for — Megan Griffiths' solidly constructed independent film. Featuring a stellar turn by Toni Collette as a talented senior writer for a Rolling Stone-like magazine that's been nearly made obsolete thanks to the iTunes driven TMZ world, as the film opens Collette's rock journalist Ellie Klug is given yet another ultimatum by her longtime friend and editor (played by Oliver Platt). Told she has to reclaim her place at the magazine where content is now driven by commercial ads and clickbait traffic, she's forced to mine her personal life for a story when assigned to track down her Kurt Cobain/Elliott Smith/Jeff Buckley inspired rocker ex Matthew Smith, who'd abandoned her fifteen years earlier without a word. Whereas half of his fans have been hanging on to the dream that Smith is alive, the rest gave up on that idea years ago after his car was found deserted near a waterfall. Reluctantly journeying after the man who not only broke her heart but also took a piece of it with him when he disappeared, Ellie soon discovers that the search for the truth about Smith may also hold some answers about her own life that she might not be ready to face. Regularly taking part in casual hook-ups, Ellie often mixes business with pleasure, walking away before things get too serious — keeping herself cut off from love as though she was involved in a high stakes game of emotional Russian roulette — undoubtedly too scared to put herself out there to be hurt once again. After footage of what sounds an awful lot like Matthew singing about a blue-eyed love comes to the attention of the magazine, Ellie's sense of purpose only increases. Almost out of money and swindled by a conman, Ellie reluctantly travels with a rich, straight laced, and brutally honest friend played by Thomas Haden Church who informs her that he'll happily fund her mission if he can record the process to put the skills that he learned in a documentary filmmaking community college course to use. While Church plays well off Collette as the embodiment of two wrongs that we suspect may eventually and unexpectedly balance each other to make a right, his character is so unhinged and overly confessional that it comes across as slightly gimmicky — as if he's playing him like a filter free adult with a slight personality disorder. And as such, he needlessly pulls focus from the main storyline. Likewise, while both characters are so well written and likewise embodied by two stellar talents, it's unfortunate that aside for the tale of midlife coming-of-age, the screenwriters didn't really have anywhere for the film's protagonists to go. And at times it feels as though Church could've wandered in from a different movie altogether. 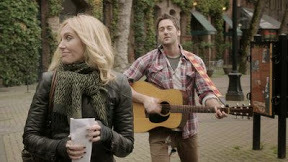 This problem is undeniably magnified after Ellie has a fling early on with an up-and-coming musician (played by The Blacklist's Ryan Eggold), with whom she shares naturally palpable chemistry, especially when contrasted by the offbeat dynamic that's established by our two unlikely travelers in the last half of the picture. Of course, the decision to let the lead wind up with a younger partner would never have even been questioned if a) the genders had been reversed and b) it would have been a Something's Gotta Give-like studio venture. Thus, it's a shame that the otherwise authentic, easy banter between Collette and Eggold is ignored in favor of seeing the heroine settle down with someone more traditionally suitable in a safe romantic movie cop-out. Nonetheless it's amiable enough overall that just like Give, we can still overlook Lucky's one disingenuously dissonant note and accept the couple that comes together in time for the closing credits since the rest of the film offers us such strong harmony and a relatable refrain. A striking achievement, aside from one key flaw, Lucky Them otherwise gets so much right. And much like Allison Anders's Grace of My Heart and Lisa Cholodenko's Laurel Canyon, rising star helmer Megan Griffiths strikes a beautiful chord (in tandem with her always impressive lead), while introducing us to a woman that rocks as well as she rolls out of the way of anything that threatens to ruin her rhythm. All in all, it's a refreshing change in viewpoint from the go-go girls, groupies, goddess muse girlfriends, and interchangeable gal pals on the road often used as window dressing in most man-made behind-the-music movies of the past. For when it comes to these female-helmed works, to those determined to shake up gender depictions in the world of journalism and rock, we salute you.